Duplicates are a major curse while working with addresses. 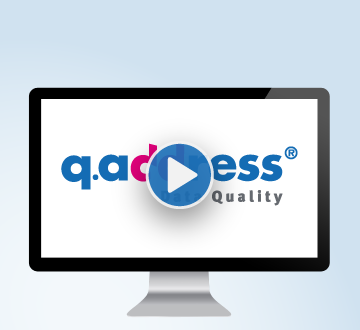 q.address will automatically cleanse your data, merge your data duplicate free, correct your national and international addresses, generate the salutations, update your business addresses and phone numbers, and do so much more for you. Keep on reading! We are happy to take care of projects, like deduplication, address cleansing, or to enrich your business addresses, etc. Further, we are glad to provide training sessions for you and your partners on how to use q.address, or to aid you with conceptualizing your projects! Keep on reading! Use q.address as you wish: on-premises to check your addresses in various files and data bases, ready to use integrations for Microsoft Dynamics 365, SAP and many more standard systems, or use the API to integrate our quality server in your own application.